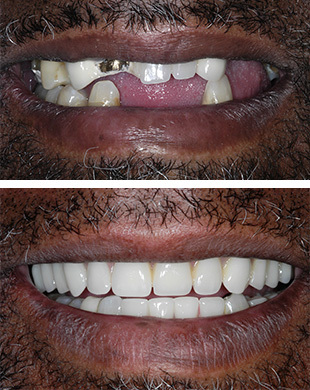 Implant-supported dentures are over-dentures fixed to the gums by mini implants. For patients who have an uncomfortable or loose-fitting denture, stabilizing it with mini implants can be a more comfortable and functional solution. Mini implants are placed in the jaw where they are anchored firmly in the surrounding bone. Attachments are placed in the underside of the denture to connect to the implants. When placed in the mouth, the denture snaps onto the implants, which keep it stable and secure.